Create an engagement album that’s memorable, romantic and unique to your winter love story with these inspiring Boston winter engagement photo ideas. Maybe we’re a little bit biased, but we love Beacon Hill engagement photos in every season, especially in the winter. The historic row houses and brick sidewalks offer true urban charm for the bride- and groom-to-be that would prefer a touch of traditional in their engagement photos. Beacon Hill’s landmark architecture looks ever-so-enchanting after being dusted with a winter snowfall, too. Boston’s rich history has left residents with a vast assortment of settings for romantic photos, including the opulent Boston Public Library or bustling Quincy Market. Seasonal twinkling lights and decorative evergreens make these Boston landmarks ideal for shooting in the winter. Tailor your engagement session to your love story with Boston’s full complement of fun and iconic photo locations. If your courtship was sports-centric, take a few snapshots at TD Garden. If you love all things nautical, your seasonal, sea-inspired photo shoot will come alive at Piers Park. Each of these winter photo engagement settings will help you capture the romance and whimsy of Boston. The Hampshire House will roll out the red carpet for the Beacon Hill Civic Association’s star-studded Oscar Night Cocktail Party on Sunday, Feb. 22. Movie-lovers, BHCA supporters and those who love an old-fashioned, black-tie affair will delight in this Academy-acclaimed event. Event-goers can expect to get the V.I.P. treatment, with butler-passed and stationary hors d’oeuvres, red carpet photos and live entertainment, all while enjoying Hampshire House’s fit-for-a-celebrity backdrop. The event will also feature a movie trivia game with prize drawings. Guests are invited to wear their best red carpet attire. Two drink tickets, hors d’oeuvres, tax and gratuity are included in the $55 per person ticket price. To purchase tickets, visit www.bhcivic.org/index.htm. This A-list event will help support the Beacon Hill Civic Association, a neighborhood organization whose main goal is to preserve and enhance the quality of life on Beacon Hill. 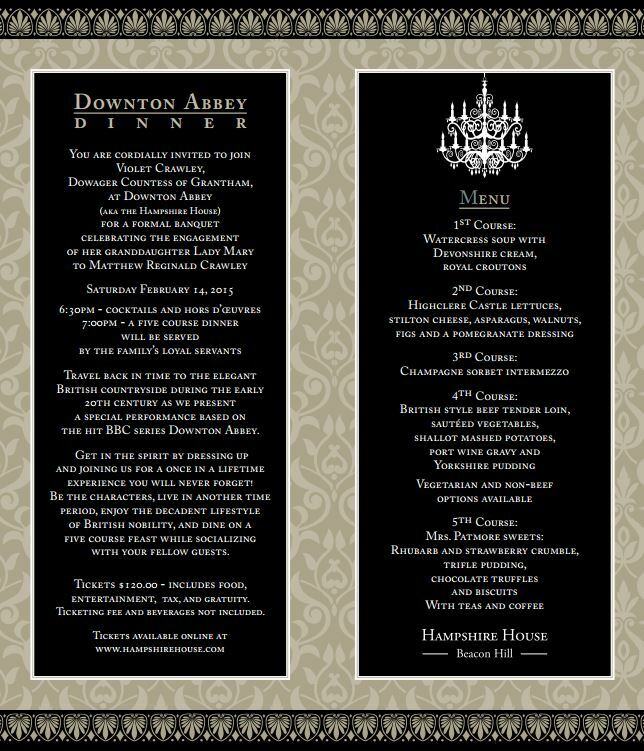 Hampshire House’s Downton Abbey Dinner – This Weekend! Downton Abbey fans are cordially invited to the Hampshire House on Saturday, Feb. 14, for a once-in-a-lifetime Downton Abbey Dinner set amidst an authentic Georgian revival backdrop. Our mansion’s intricate woodwork, opulent chandeliers and elegant Palladian windows will make you feel like you’re dining in Downtown Abbey. This enchanting evening will feature a period-inspired five-course dinner complete with Devonshire cream and royal croutons, champagne sorbet, British-style beef tenderloin and a spread of Mrs. Patmore’s sweets. Hampshire House will also present a special performance based on the hit BBC show. This decadent dining experience will make for an unforgettable Boston Valentine’s Day date. The Hampshire House Downton Abbey Dinner will take place Saturday, Feb. 14 at 6:30 p.m. Cocktails and hors d’oeuvres will be followed by a lavish 7 p.m. dinner. The cost is $120 per person and includes food, entertainment, tax and gratuity. Vegetarian and non-beef options are available. Tickets still available! Welcome to the new Hampshire House blog — a blog that details happenings around the area and at our intimate, Beacon Hill mansion. Our new blog will also offer top-tier tips and ideas for your Boston wedding, rehearsal dinner or corporate event. This site will give you exclusive insight into Hampshire House’s unforgettable events and will be the prime Boston wedding blog for your unique affair. Get an unrestricted glimpse into the opulent world that is Hampshire House right here on our blog.